The first time I walked into a Daiso my brain just about exploded. Before then I had no idea such a paradise existed—a little slice of Tokyo packed with Japanese beauty products, bento boxes and novelty dog costumes. (See: All my favourite things.) To this day, walking up and down the aisles brings me nothing but joy. No matter the state of my bank balance, I know I can afford SOMETHING. (For the uninitiated everything in Daiso costs $2.80 unless otherwise marked.) Often, I go overboard, lugging home bags of Hello Kitty snacks, jewellery organisers and quirky stationery. Where else can you fill your basket with every impulse purchase in sight and know you won't have to worry about the damage? 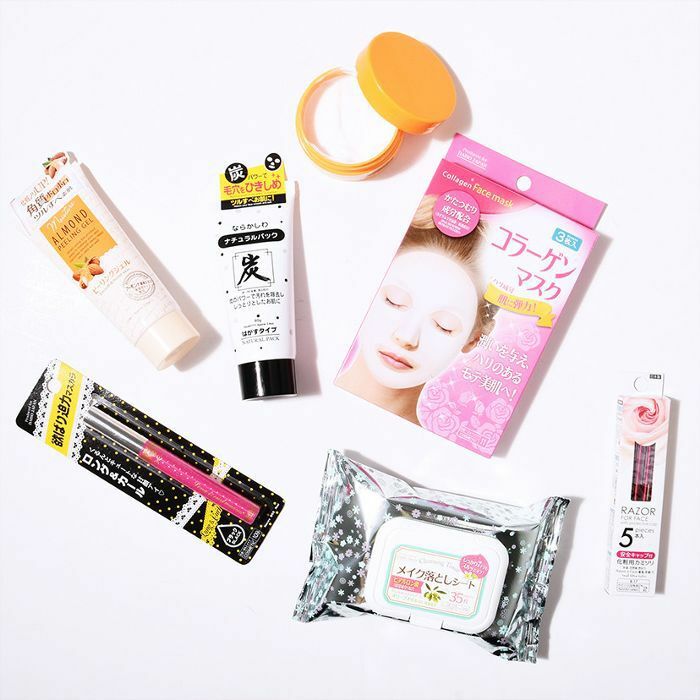 Daiso is also an underrated place to find good value skincare and makeup, and it may surprise you to know that more than one beauty editor replenishes their essentials there. That said, there are also a few, umm, questionable products available... Even when I do buy a dud (hot tip—leave the waist shrinkers on the shelf), the fun of having trialled something new always makes the purchase justifiable for me. Plus, when I do discover something amazing, it's made all the better when I remember it'll only set me back a few bucks to repurchase. If you're keen to know what's good (and what's not), keep reading for a review of what beauty editors buy at Daiso for just $3. Confession: I mainly bought this because I knew I could scare my blind-without-glasses husband by wearing it first thing in the morning. (FYI, it totally worked—10/10 would recommend as a Halloween prank.) As much as I enjoyed it's scare value, the ear loops actually did a great job of fixing sheet masks to my skin. While I'm not 100% convinced it boosted the hydrating properties of any mask I wore underneath, it did enable me to walk about the house with one on. I also felt that because it is made from silicone it prevented the essence from the sheet masks I used it with from drying out too fast, which can only mean good things for my face, right? Apparently you can also wear it as-is in the bath, the idea being that the perspiration it causes is somehow beneficial. Not sure why you'd want to do that exactly (detoxification? ), but I decided to skip it purely because I didn't like the idea of locking my own sweat to my face. Peeling gels are a big deal in Japanese skincare, but not so much in Australia which is kind of a shame. Essentially, they're chemical exfoliators that are activated by being rubbed into the skin. If you think you'd enjoy SEEING your dead skin sloughed away, you will be both satisfied and obsessed by this. I was a bit scared this particular formula would be overly harsh, but I actually found it to be quite gentle. (Plus, because it's made with sweet almond extract it has a soft marzipan scent I love.) I used it once on my face, then again immediately afterwards to check if the teensy balls of "dead skin" were actually what was promised and not the product balling up itself. On the second round I got a lesser peeling result which made me feel like it worked. Okay, these smell a bit like dish soap but they're actually pretty effective. Not only did I try them on my face to see how they'd fare against makeup and grime, I also painted several long-wear liquid lipsticks on the back of my hand to see if they could remove those. They did—impressive. The wipes contain hyaluronic acid and olive oil which I assume is the reason they leave skin soft and smooth. I probably wouldn't recommend using them every single day but then again I don't advise using any face wipes in place of a proper cleanser. As someone who doesn't shave her face (but knows PLENTY of women who do), I can't say I tried these flat razors all over my mug. However, I did test one out both around my eyebrows and on my arm to see how it'd stack up. First, I carefully swiped a razor in-between my brows to remove the fine hairs there that I usually pluck. The razor was sharp enough to shave the hairs off in one pass, and I'll admit I loved the extra-smooth feeling of having removed my brow fuzz. Next I tried it on my arm. I whisked it downwards from elbow to wrist, and it left a clean shave behind. The best bit? No nicks! Disclaimer: My arm hair is fine and blonde—if yours is coarse you might get a different result. I'll cut to the chase—I've found my new go-to budget mascara in this Daiso cheapie. That said, I'm more into clean definition and length than volume, so if that's your bag you won't love this. The formula is dry which means it doesn't smear on my eyelids, and it's also clump-free. It doesn't grant the same crazy-long lashes my beloved Lancôme Grandiôse ($54) does, but for $3, I'll take it. I had no idea at the time of purchase that these little face scrubbers are actually silkworm cocoons. That doesn't sound too gross...until you Google it. (Silkworms spin them from their salivary glands. Bit yuck, right?) A quick search revealed that the Japanese prize silkwood cocoons for their ability to improve acne marks, fine lines and discolouration. Apparently when you soak the cocoons in water, as you're instructed to do before you rub them on your skin, they release a protein called sericin. Sericin has been shown to lock in moisture to the skin and replenish collagen. I haven't been using them long enough to see lasting results but I can say my skin is already smoother. I was really excited to give these a try until I clocked this line on the packaging: "Snail secretion filtrate included." While I know snail secretions have been used for everything from anti-ageing to slicking Kim Kardashian's hair back, I still wasn't sure about putting a mask containing them on my own face. Call me a wuss, but I had to take a sheet mask out of the packet and sniff it cautiously before making the call. Turns out, they actually smell quite nice—subtly floral. The mask itself was too big for my face so it took a bit of arranging to get it to stay in place. Once I took it off, my skin felt refreshed and plump. It's definitely not the best mask I've used (you can find my go-to sheet mask here) but for $3 it's delivers an impressive moisture boost. Before I used this charcoal gel mask I Googled a bunch of reviews to make sure I was about to use it correctly. Not sure if that was a mistake because I stumbled across a write-up in which the reviewer praised the mask for removing the peach fuzz from her face. This terrified me. (Cue: Visions of accidentally ripping my own eyebrows off.) Since I wasn't keen on waxing my face, I applied it just to my nose. Having painted on what was essentially a DIY nose strip, I sat back and let it dry. Fifteen minutes later, the fun began. Remember painting your hands with wood glue as a kid, then peeling the dry snakeskin-like stuff off in ribbons? That's basically what it was like ripping this mask off. It was FUN. And it seemed to leave my pores cleaner. While I probably won't use it all over my face, I'll continue to use it for makeshift pore strips. Sandals = cracked heels. This buttery cream promises to soften dry feet (and probably other things—I can't read Japanese), but I wanted to know if it could stand up against my favourite body butter of all time. While I can say Heel Soften Cream does what it advertises, I personally wouldn't purchase it again. It smells a bit like Brylcreem which, if you're under the age of 80, you probably won't have heard of. (My pop loved it so much he used it his whole life—just one of the cute old man memories I cherish of him.) That said, the texture is velvety and feels lovely on. It also absorbs pretty quickly which means it won't make your feet sweat in your shoes. The thought process behind this purchase was along the lines of "can attaining a Kardashian-esque waist be as easy as wrapping a clear piece of plastic around my middle?" Turns out it's not. Even if it was, this product fails in part because I couldn't figure out how to keep it on my body. It doesn't come with anything to keep it in place (or any instructions) so I improvised by using gaffer tape. Even then, the plastic wouldn't sit smoothly which made it impossible to wear under clothing without looking lumpy. I assume the idea behind the wrap being plastic is that it increases perspiration which then makes the area smaller. (This seems to be a common theory behind many Japanese weight loss products.) I'm not a scientist, but I do know it's not possible to spot reduce by way of sweating in one area. Sorry Waist Wrap, you're going in the bin. These gel pads have an adhesive back so you can stick them on any part of your body that needs cooling, however the pack only recommends the forehead and the back of the neck. (Probably because they're meant to be for migraines.) Since I thought the only thing they delivered was "coolness", I stuck one on my lower back on a particularly sweaty day. It was instantly cold and stayed that way for about an hour, but it also made my skin feel tingly. (Not tingly bad, just tingly in the way of a good muscle spray.) I gave the second one to my husband to test against a headache which may or may not have been caused by me watching lip sync battles on YouTube for the better part of a day. According to him, it relieved the pressure in a matter of minutes. Want more product recommendations? Follow us on Pinterest.